Customer Relationship Management Training Materials will help equip your business with a solid introductory level of understanding of how to properly manage customers. Train your employees the different faces of CRM, strategies for customer retention, customer profiles, customer lifecycles and more! Seeing is Believing This sample manual to teach Customer Relationship Management is in MS Word format. Have you been considering training Customer Relationship Management to your employees, but aren’t sure how to navigate the maze of information needed to put together a stellar workshop, or don’t have the time to prepare all of technical and complicated systems theories involved? Don’t worry! Velsoft Courseware has put together Customer Relationship Management Training Materials to make it easy for trainers to teach their students how to implement CRM in their business, beginning with the basics of terminology and whether or not customer relationship strategies are right for them, and moving on to how to use CRM to improve client relationships and the ins and outs of effective client management. 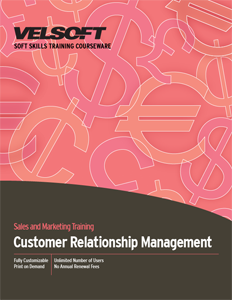 Velsoft’s training material on building CRM is chock full of customizable content and activities for students. Trainers can even combine it with Velsoft’s eLearning courseware as part of a blended learning solution, so students can learn how to build excellent customer relations while working through parts of the course at their own pace.